Our Europe road trip had taken us from Milan through Slovenia and into Croatia, which we used as a base to explore places like Bosnia and Montenegro. From Croatia we had driven the length of Serbia, into Macedonia and finally into Athens. Our next move was up into Denmark, but having already driven thousands of kilometres, and frankly needing a rest from the car, we decided to take a short cut and catch a ferry from Greece to Ancona, Italy. It should be a good idea right? Shave off thousands of kilometres of driving, time and fuel, and have a good night sleep at the same time. 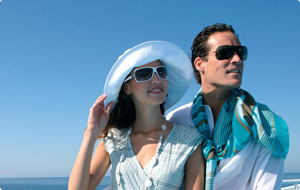 And what better way to immerse yourself in the Mediterranean than to be on it? If it sounds like a smart move to you too, then you should be aware of some things before undertaking this journey. Things we did not know before our overnight trip. 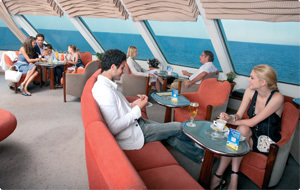 Expecting moments like these on your Adriatic ferry? This is the image Anek wants you to have. It was a hot July afternoon in our Athens Airbnb apartment when we decided to take that short cut we mentioned earlier. 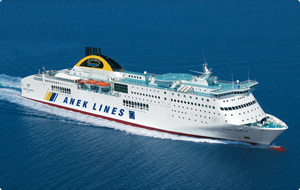 Navigating the Anek website was tricky because it was difficult to find information on what the ferry had in terms of rooms and facilities. We noted there was a pool, restaurant, a bar or two, and parking for our leased Peugot car. What wasn't clear was whether or not food was included in the price, as well as details of the cabins - size, bedding, bathroom, fridge, etc. It appeared that food was extra but we deduced that from reviews and other clues from websites. Eventually we ended up booking an "A2 2Bed external" cabin. It only had two single beds, a bathroom and a window looking out. It was the best option for us and also included the car. The ferry was due to depart the next day at 14:30 and the email confirmation informed us we should be in Patras at least 2 hours before the scheduled time of departure. The booking process itself was fairly smooth despite the price - the total cost came to an astounding 473 Euros... which included 89 Euros for the car. This is for just an overnight transport. We reasoned that we were still saving a lot on fuel costs as well as hotels we would have needed, should we have trekked back across in the car. ​​Upon arrival in Patras the following day, we searched the port area but couldn't locate the terminal. There were no clear signs, only an "Anek" banner near the road. We drove around for ten minutes in the parking lot until we saw a building that most looked like the Anek terminal. There were no ships at the dock. Once we stepped inside, it was clear we had chosen correctly. The check in process was not smooth either, despite the lack of many other passengers. We were directed from one window to another, and there was a misunderstanding regarding the reservation. Finally we were given a sign to put in the car and told where to line up. We were also informed the ferry was "late". At the gate, an officer checked our tickets, passport and the car sign and admitted us to an area in which embarking cars and passengers wait until given the signal. While we waited in the car park area, the sailing time arrived but there was still no ferry. There were no facilities in this area and it was in the full sun. Shortly we saw the ship arriving on the horizon and a half hour later it was docked and vehicles were exiting the hull. We continued to wait and suddenly it was time to drive on, only noted by the fact that cars and trucks were beginning to embark. There is no way to describe it other than chaotic. Once you drive on board, you are being shouted at by several crew members and directed to a very tight spot to park. The parking itself is easy due to the (very) clear direction. But once you're out of the car, they yell at you to hurry up and get your bags so the next car can park. We were relieved to be out of that intense environment and into the reception area. When arriving at the reception desk, we waited for a lengthy time again (there was only us and one other couple). Finally someone arrived who could check us in and we were given our key without welcome, emotion or direction. We found our cabin and stepped inside. Our initial impression was that it was basic. There were two single beds, fixed to the ground, one bedside table in between and a compact wardrobe where you could store clothes. There was no fridge but a small TV was in the room, showing information about the ship. The spartan bathroom contained only the absolute essentials. However, it was clean and the water pressure and temperature in the shower was sound. The beds were what you would find on a transport ship - functional, fixed to the ground and compact. Only if you booked the "Lux" cabin would you get a queen sized bed (this is the one they show on the Anek website's "cabins" page). Comfort-wise, it was ok for one night and again, the linen was spotless and pillows were not old. There really is nothing more to say about the cabin because that was all. We were grateful to have an outside cabin because the window made it feel less claustrophobic. If you are thinking about an inside cabin, remember that these transport ferry cabins are small in size. If you are prone to feeling panicked and claustrophobic, then reconsider booking an inside cabin unless you are prepared to be outside for the majority of the time. Even with a window, we needed to get out and about on the ferry frequently to avoid that closed-in feeling. We got the cabin set up and bags put away and now it was time to survey the ship and what it had on board. 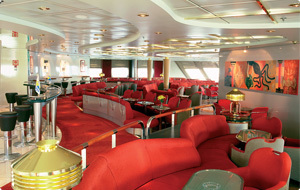 There were two decks of accommodations, and one for the restaurants and bars. An elevator and set of stairs brought you to the different floors and also to places like the car deck and truck area if you needed. On the deck we will describe as "general area" deck, there was a small store selling gifts, a counter that looked like a bar as well as two restaurants, one enclosed and one at the front that was openly laid out. There was a lot of seating in these areas as well as plants to create green spaces. Back inside, the restaurant at the front was not sophisticated and was simply an open eating area with seats and windows. The atmosphere inside was unappealing due to the lack of people and use as a hang-out area for some of the truck drivers. It was also expensive as was the other restaurant further back. Due to the uninviting nature of the eateries and price, we only bought a coffee from the bar on the general area deck. From our experience and advice, you are able to take food with you. Keep in mind that there is no way to heat any food though, nor is there a kettle in the room to heat water. There was another lounge restaurant towards the rear, but it was mostly filled with the truckers that frequent these journeys and also did not look welcoming. The shop was empty of people for most of the voyage and we did not go in to see what they had. Wi-Fi is advertised as being "available". Well, it is available for a cost and they charge in blocks of one hour for 5 Euros. It is satellite based, meaning it is not that fast and cuts out periodically. To buy the one hour cards, we went to the self-service bar/cafe counter and purchased it from one of the staff there. 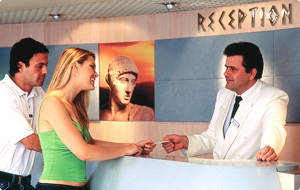 That is all the facilities you will find on board. It would have been great if the pool actually had water and if there was a fitness centre. But because the ferry is used for truck transport, the operator therefore doesn't need any of these facilities to attract customers. Because the inbound ferry was late, we departed about 2 hours behind schedule. The departure went smoothly and we didn't feel a thing as the vessel made its way out of the harbour. Throughout the journey, overnight and into the next day, the weather was clear and the sea was calm. Therefore we did not feel any discomfort in relation to the weather and sea conditions. There was a scheduled stop on the journey, at Igoumenitsa, which we arrived at well after sunset. The ferry stopped here for an hour before continuing on towards Italy. 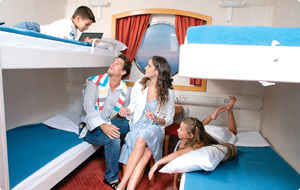 Throughout the night, people who had not booked cabins were gathered in corners and corridors. There was a lot of noise from people walking up and down and talking loudly into the early morning. It's not a place to relax and have a good night's sleep due to the nature of it being a transport vessel. The people that are on board are not in that mindset and are eager to carry on with their journey. 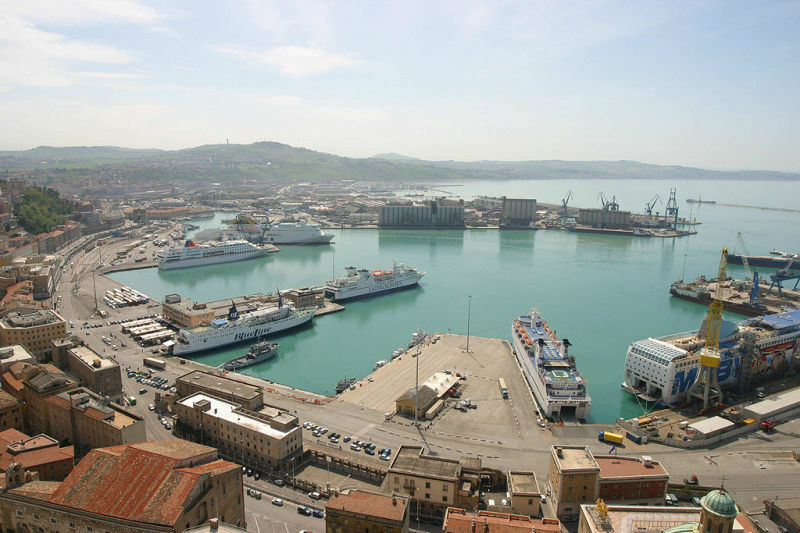 The ferry was due to arrive at 11:00am into Ancona. During the journey, we did not gain any time and subsequently pulled into the Italian port two hours late. Several hours prior to reaching our destination, the crew announced the impending arrival and instructed everyone to check out of the rooms and prepare to depart. At this point, it started to get out of control. After leaving the cabin, we descended down to reception where there was a long queue of people. People were getting restless and the crew were not handling the situation well. We finally checked out and from here there were no further instructions. There were queues of people in every stairway. We could not remember which one led to our car as there were no signs and we ended up standing in an unknown line. In the meantime, the ship docked and people were beginning to move out. When we went through the doors, we found ourselves at the very rear of the ship (the part where all pedestrians and vehicles disembark). There was no one to ask for help in directions as they were all rushed and creating a chaotic atmosphere, shouting at everyone to get out. We made our way through different doors and ended up in the truck area, where again the staff was shouting at us aggressively in Greek. We found another stairs which led us back up as other passengers were going down, crushing each other and us in the process. Finally, we located the deck where the car was, only to find that they had already started loading new cars! We rushed to get out before being blocked in, all the while staff were shouting at everyone to hurry up. At no time during this whole frightening experience, did any of the staff offer to help when we asked, nor did they speak English. They were all in such a rush and shouting at everyone that they had lost all sense of what the point of their being on there was in the first place - to assist people to get in and out of the vessel. What a relief it was to drive our car out into the Ancona streets and onto the highway away from that chaos. Our experience on this Mediterranean ferry was not a positive one. The original purpose was to savour our time on board, taking in the sea air, resting and having a refreshing sleep while the vessel relocated us from one part of Europe to another. 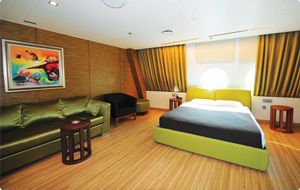 Upon browsing the website, reading the descriptions and studying the photos, our impression was that of a cruise ship. The reality is very different. It is no more than a utilitarian transport vessel for truck drivers and the ship has the facilities that cater to that group. If you decide to take such a ferry, keep in mind that only the fundamentals are supplied for you to eat and sleep. Don't expect to "live beautiful, leisurely, carefree moments sipping refreshing cocktails at the pool bar" - as quoted on the website's description of the deck. These words are misleading and will only lead to disappointment if you have never been before and don't know the reality.